The most common reason for nasal obstruction is mucosal hypertrophy of the inferior turbinate, followed by structural deformity of the nasal airway (septal deviation, bony inferior turbinate hypertrophy). Numerous interventions are available for the treatment of nasal obstruction secondary to inferior turbinate hypertrophy including medical treatments (immunotherapy, antihistamines, intranasal corticosteroid sprays, decongestants) and surgical options (corticosteroid turbinate injections, cryosurgery, electrocautery, turbinate out-fracture, microdebrider-assisted turbinoplasty, excision and submucous resection). The goals of inferior turbinate surgery include volume reduction, a reduction in nasal obstruction, and maintenance of nasal function while minimizing complications. There is currently no consensus on the most effective technique. Radiofrequency turbinate reduction (RFTR) is a minimally invasive surgical option that can reduce tissue volume in a precise, targeted manner. This technique uses radiofrequency to create lesions within the submucosal tissue of the turbinate, reducing tissue volume with minimal impact on surrounding tissues. [2, 3] Radiofrequency turbinate reduction differs fundamentally from traditional methods by using low-power radiofrequency energy to provide a relatively quick and painless procedure for tissue coagulation. An explanatory video of the procedure is below. Radiofrequency turbinate reduction. Image courtesy of Gyrus ACMI-ENT. The video below depicts RFTR being performed. In this patient, stacked anterior lesions are placed under local anesthesia in the clinic. Topical aerosolized lidocaine was administered; 1% lidocaine with 1:100K epinephrine was slowly injected into the turbinate. Two lesions were placed on this side. 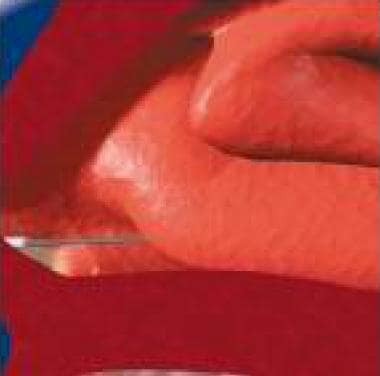 Ideally, the lesion is placed slightly deeper to avoid the mild mucosal ischemia seen toward the end of energy delivery. Video courtesy of Vijay R Ramakrishnan, MD. Overall, RFA has a low complication rate and has been shown to reduce nasal obstruction secondary to inferior turbinate hypertrophy; however, recently published studies suggest advantages to microdebrider turbinoplasty. The lateral nasal walls contain 3 pairs each of small, thin, shell-like bones: the superior, middle, and inferior conchae, which form the bony framework of the turbinates. 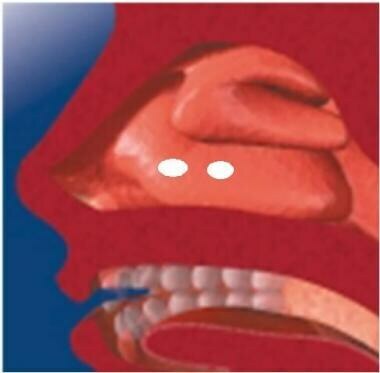 Lateral to these curved structures lies the medial wall of the maxillary sinus. No absolute contraindications exist for radiofrequency turbinate reduction. However, the use of the radiofrequency turbinate reduction system is contraindicated in patients with heart pacemakers or other electronic devices unless they can be temporarily deactivated. When the procedure is performed with the patient awake, topical lidocaine 4% and a vasoconstrictor (eg, phenylephrine HCl) are applied via spray to each nasal cavity, followed by injection of 1 mL 1% lidocaine with 1:100,000 epinephrine into each inferior turbinate. For the stand-alone procedure, seat the patient comfortably in an examination chair with dispersive electrode placed over a well-vascularized muscular site (eg, lower back or lateral scapula) with full contact to the skin. 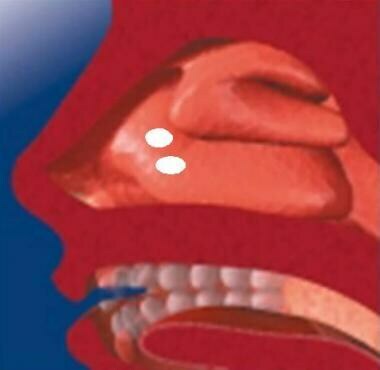 When performed in the setting of another nasal surgery, no special positioning is required. Insert the handheld needle electrode into the anterior portion of the inferior turbinate, as shown. Electrode insertion into anterior portion of the inferior turbinate. Image courtesy of Gyrus ACMI-ENT. Insert the needle electrode into the middle portion of the inferior turbinate from an inferomedial approach to deliver 350-500 joules, 2-10 watts, and 70-80 volts, with a target temperature of 80°C per lesion. The activated system usually takes 2 minutes per lesion. The depth of insertion should be 5 mm to reduce the risk of damage to the mucosa, causing ulcerations or sloughing. Single anterior lesion. Image courtesy of Gyrus ACMI-ENT. Anterior and mid lesion. Image courtesy of Gyrus ACMI-ENT. Stacked anterior lesions. Image courtesy of Gyrus ACMI-ENT. Stacked anterior lesion, mid lesion, and posterior lesion. Image courtesy of Gyrus ACMI-ENT. Anterior, mid, and posterior lesions (4-lesion procedure). Image courtesy of Gyrus ACMI-ENT. Placement of the needle too superficially may result in damage to the mucosa, including ulceration or sloughing of mucosal tissue. If the lesion takes more than 2 minutes to form, the needle electrode may be too close to the conchal bone. If the turbinate is enlarged in the anterior and mid-portion, 4 row lesions are recommended. Patients may experience mild to moderate pain during treatment of the posterior inferior turbinate. This can be controlled with additional local anesthetic injection. Mild-to-moderate edema with subsequent nasal obstruction and thick mucus formation can be expected for the first week after the procedure. If performed along with a septoplasty, scar tissue may form between the turbinate and the septum. Goode RL. Diagnosis and Treatment of Turbinate Dysfunction: A Self-Instructional Package. American Academy of Otolaryngology-Head and Neck Surgery Foundation, Inc.; 1977. Coste A, Yona L, Blumen M, et al. Radiofrequency is a safe and effective treatment of turbinate hypertrophy. Laryngoscope. 2001 May. 111(5):894-9. [Medline]. Ercan C, Imre A, Pinar E, Erdogan N, Umut Sakarya E, Oncel S. Comparison of submucosal resection and radiofrequency turbinate volume reduction for inferior turbinate hypertrophy: evaluation by magnetic resonance imaging. Indian J Otolaryngol Head Neck Surg. 2014 Sep. 66(3):281-6. [Medline]. [Full Text]. Hytönen ML, Bäck LJ, Malmivaara AV, Roine RP. Radiofrequency thermal ablation for patients with nasal symptoms: a systematic review of effectiveness and complications. Eur Arch Otorhinolaryngol. 2009 Aug. 266(8):1257-66. [Medline]. Liu CM, Tan CD, Lee FP, Lin KN, Huang HM. Microdebrider-assisted versus radiofrequency-assisted inferior turbinoplasty. Laryngoscope. 2009 Feb. 119(2):414-8. [Medline]. Gindros G, Kantas I, Balatsouras DG, Kaidoglou A, Kandiloros D. Comparison of ultrasound turbinate reduction, radiofrequency tissue ablation and submucosal cauterization in inferior turbinate hypertrophy. Eur Arch Otorhinolaryngol. 2010 Nov. 267(11):1727-33. [Medline]. Berger G, Ophir D, Pitaro K, Landsberg R. Histopathological changes after coblation inferior turbinate reduction. Arch Otolaryngol Head Neck Surg. 2008 Aug. 134(8):819-23. [Medline]. Salzano FA, Mora R, Dellepiane M, Zannis I, Salzano G, Moran E. Radiofrequency, high-frequency, and electrocautery treatments vs partial inferior turbinotomy: microscopic and macroscopic effects on nasal mucosa. Arch Otolaryngol Head Neck Surg. 2009 Aug. 135(8):752-8. [Medline]. Utley DS, Goode RL, Hakim I. Radiofrequency energy tissue ablation for the treatment of nasal obstruction secondary to turbinate hypertrophy. Laryngoscope. 1999 May. 109(5):683-6. [Medline]. Porter MW, Hales NW, Nease CJ, Krempl GA. Long-term results of inferior turbinate hypertrophy with radiofrequency treatment: a new standard of care?. Laryngoscope. 2006 Apr. 116(4):554-7. [Medline]. Yildirim B, Uysal IO, Polat C, Gok C. [The efficacy of radiofrequency ablation technique in patients with inferior turbinate hypertrophy]. Kulak Burun Bogaz Ihtis Derg. 2008 Mar-Apr. 18(2):90-6. [Medline]. Casale M, Bottaro V, Sabatino L, Frari V, Bressi F, Vespasiani U, et al. The efficacy of radiofrequency volumetric tissue reduction of hypertrophied inferior turbinate in simple snoring. Eur Rev Med Pharmacol Sci. 2014. 18(15):2160-8. [Medline]. Assanasen P, Choochurn P, Banhiran W, Bunnag C. Radiofrequency inferior turbinate reduction improves smell ability of patients with chronic rhinitis and inferior turbinate hypertrophy. Allergy Rhinol (Providence). 2014 Mar. 5(1):12-6. [Medline]. [Full Text]. Temperature controlled radiofrequency [package insert]. Bartlett, TN: Gyrus ACMI-ENT. Kezirian EJ, Powell NB, Riley RW, Hester JE. Incidence of complications in radiofrequency treatment of the upper airway. Laryngoscope. 2005 Jul. 115(7):1298-304. [Medline]. Images and video are used in agreement with GYRUS ACMI-ENT. Medscape Reference also thanks Vijay R Ramakrishnan, MD, Assistant Professor, Department of Otolaryngology, University of Colorado School of Medicine, for assistance with the video contribution to this article.